Even if you don’t fear rodents, there are many reasons to fear them in your home. Disease Rats are vectors, or spreaders of disease, over 35 in fact, including hantavirus, salmonellosis, rat-bite fever, leptospirosis, and of course, the plague. Some are spread directly through contact or contamination of food with urine or droppings, and others indirectly through parasites like fleas and mites. Allergies and asthma. Allergies to dust and mold are often written about, but did you know that the number of people affected by rat allergens is equal to the number allergic to dust and mold? 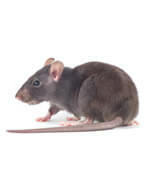 Rat droppings have also been proven to trigger asthma attacks. Structural Damage. An estimated 21 million rats winter over in houses each year, and while they’re there, thanks to their sharp teeth, eat just about anything, including molding, insulation, roof soffits, and wallboard. Fires. Another thing rats try to eat is the electrical wiring. Studies have found that 25% of house fires can be attributed to exposed wires stripped of insulation by rodents. Eradicating Rats. Trap or Kill? Of course, you don’t want to share your home with rats, but what is the safest most effective way of getting rid of them? Poison is a popular method, as are spring triggered rat traps which are just over-sized mouse traps, and often not up to the job. But poison poses a danger to your children and pets, and traps, even if they work, leave the dead rat behind for you to remove. Besides, if the rat has been feeding happily on your house, he’s probably not hungry, so he won’t go for the bait in either case. The smart thing to do is to hire an expert rat trapper like the ones at Critter Control®. Before setting down the first rat trap, our professional rat trappers will look around to determine if you do indeed have a rat problem. They will search for rat feces, and identify the areas through which the rodents are entering. Only then will they get down to the business of trapping the rats as humanely as possible. Whether you know, or just suspect rats in your home, the expert rat trappers of Critter Control® Southwest Florida can ease your mind. Call us today at (941) 584-4703 for a free consultation.